Li, H., Chen, M. L., Lv, H. F., Yang, F., Yu, L. L., Fei, B. H., and Ma, X. X. (2018). "Effects of guanylurea phosphate treatment on the performance of decorative bamboo filament," BioRes. 13(2), 3487-3499. Decorative bamboo filament is a new material made with bamboo filament by weaving or adhesive. When it is used in indoor wall and ceiling decorations, the fire resistance of the decorative bamboo filament is very important. Guanylurea phosphate (GUP) flame retardants were used in this study to treat decorative bamboo filament. The microstructures before and after the flame retardant treatment were observed by environmental scanning electron microscopy. The effects on the heat release and smoke release were also evaluated with cone calorimetry. The resistance to mildew was tested before and after the modification. The results showed that the GUP fire retardants had good deposition in parenchyma cells. The treated samples containing 25% GUP effectively reduced the heat and smoke release. The peak value of heat release rate (PKHRR) and the total heat release (THR) in 115 s was respectively reduced by 44.9% and 42.2%; the peak value of smoke release rate (PKSPR), the total smoke production (TSP), and the specific extinction area (SEA) of treated decorative bamboo filament was respectively reduced 67.4%, 95%, and 94.4%. The prevention of mildew was slightly enhanced. The prevention rate of Trichoderma viride even reached 100%. With the improvement of living standards and environmental awareness, natural environmental decoration materials are growing in popularity. Due to its fast growth rate, short rotation age, elegant color and grain, and good mechanical properties, bamboo is a promising interior decorative material for flooring, roofing, screen, curtain, furniture, and art craft. Different from common bamboo decoration materials, decorative bamboo filament is arranged in parallel by bamboo filament, which is cut in the direction of fiber structure. The bamboo filament has less thickness, excellent visual appearance, and good flexibility, which makes it compatible with nature. After weaving, printing, or dyeing, it can be modified further with a special texture effect (Yu et al. 2015). Due to its excellent environmental performance, graceful appearance, plasticity, and its convenient installation and removal, decorative bamboo filament is becoming popular as an interior decoration material that can substitute for traditional wallpaper or paint (Li et al. 2016). However, bamboo contains a large amount of extracts, hemicellulose, and nutrients, such as starch in parenchyma (Liese 1998; Liu et al. 2015). Precisely because of this chemical composition, the decorative bamboo filament is flammable and vulnerable to attack by fungi (Ma et al. 2012; Guan et al. 2013). To improve the flame retardant and anti-mold performance, numerous modifiers have been researched, such as boron compounds, ammonium polyphosphate (APP), monoammonium phosphate (MAP), phosphorus/ nitrogen/boron compounds (P-N-B), and guanylurea phosphate and boric acid mixture (FRW) flame retardant (Kurt et al. 2012; Jia et al. 2013; Liu 2013; Jin et al. 2015; Cui et al. 2016), which have achieved significant effects in bamboo composite materials. Nevertheless, the units of decorative bamboo filament are thinner and smaller and are more flammable. The current fire-retardant treatments applicable to other bamboo products may not be completely applied to decorative bamboo filament (Yu et al. 2017). Simultaneously, the structure of the horizontal weaving of a single bamboo filament causes the larger contact area between the bamboo filament and the air, which can increase the possibility of mold breeding (Walter 2005). However, the modifier with flame retardant and anti-mildew function which is suitable for decorative bamboo filament has not been studied as much as other bamboo products. In order to study the application of mature flame retardant and process in bamboo decorative filament, the guanylurea phosphate (GUP) treatment is applied to the decorative bamboo filament. The aim of this study is to conduct a GUP treatment on decorative bamboo filament in order to evaluate its effect on combustion performance, mold resistance as well as microscopic and macroscopic visual performance. The 6-year-old moso bamboo (Phyllostachys edulis (Carr.) J. Houz) was taken from Anji, Zhejiang Province, China. After being air-dried, the moisture content was 7%, the diameter at breast height was about 140 mm to 160 mm, and the wall thickness was 12 mm to 16 mm. The bamboo filaments were drawn from the bamboo splits, which were located outboard the bamboo skin in the radial direction by a drawing machine. The specific process is shown below (Fig. 1). The size of a single bamboo filament was 5 mm (tangential) × 1000 mm (longitudinal) × 2 mm (radial). The bamboo filaments were made into decorative bamboo filament with dimensions of 1200 mm (tangential) × 1000 mm (longitudinal) × 2 mm (radial) by horizontal weaving, and half of them were selected as treated samples, with the mass fraction of GUP flame retardant of 25%. The flame retardant was poured into the sample by the full-cell method. The treatment conditions are listed in Table 1. The decorative bamboo filament was immersed in the solution at -0.04 MPa for 24 h. When unloading pressure to reach normal pressure, the sample continued to be immersed for 60 h at 1.2 MPa. After that, all the decorative bamboo filament was placed in a room at 25 °C and 50% relative humidity for 15 days until a constant mass was reached. The percentage of GUP loading was calculated and recorded as 21.5%. Transverse and radial sections were cut from the middle of treated and untreated bamboo filament. The specimens were mounted on an aluminum stub, and the surface was sputter-coated with a gold alloy. A scanning electron microscope (FEG-ESEM; XL30; FEI company, Hillsboro, OR, USA) was used to observe the surface morphology. where △L*, △a*, and △b* are the differences between the treated decorative bamboo filament and the untreated values. The combustion performance of specimens with GUP flame retardant treatments was tested by a cone calorimeter according to ISO 5660-1 (2002). Ten specimens were cut from middle of the treated material with dimensions of 100 mm × 100 mm × 2 mm and placed horizontally under a cone calorimeter with a heat flux of 50 KW/m2. A stainless steel cover with an opening of 0.0088 m2 on the upper part was attached. The data were recorded by a computer every 5 s. The untreated group was used as reference, in which ten specimens were also selected from the middle position. The main comparative parameters included heat release rate, total heat release, smoke release rate, and total smoke release. All GUP-treated specimens and untreated material were placed at a temperature of 28 ± 2 °C and a relative humidity of 85% after 28 days in order to observe the fungal growth on the material surfaces. According to the GB/T 18261 (2013) standard, six specimens were selected for every fungus and all specimens were processed into 50 mm (longitudinal) × 20 mm (width) × 2 mm (thickness). The test fungi are listed in Table 2. SEM images of GUP treated and untreated bamboo filaments are illustrated in Fig. 2. As shown in Fig. 2a and 2b, the parenchyma and vessels of the untreated sample had an empty cell and clean pit border; almost no starch was present as a result of a hot-water soak with H2O2 (mass fraction 60%) at 50 °C. The specimen shown in Fig. 2c and 2d treated with GUP displayed the sediment of flame-retardant in the parenchyma and vessel cell. These phenomena indicated that GUP flame-retardant with the process of this study could effectively enter bamboo filament, because the sample was located in the center of the bamboo filament, which was the most difficult position for the flame retardant to penetrate. The color before and after the effects of the GUP flame-retardant treatment of decorative bamboo filament is shown in Fig. 3. As shown in Fig. 3a, the color became shallow after the flame-retardant treatment. The L*a*b* test values of the two types are graphed in Fig. 3b. For the untreated sample, the average values of L*, a*, and b* were 76.5, 5.6, and 27.6, respectively; the standard deviation of L*, a*, and b* for untreated sample was 0.839, 0.317, and 1.015. For the treated sample, the value of L* decreased slightly from 76.6 to 71.7,while the values of a* and b* showed no decrease. Accordingly, the standard deviation of L*, a*, and b* for the treated sample was 0.339, 0.117, and 0.608, respectively. The △E value was calculated as 4.86. The L* decreased slightly after the GUP flame-retardant treatment. The result might be attributed to the reduction of lignin content, which is an important factor in the color (Yu 2015). In the first step of the flame retardant treatment, the lignin of the bamboo filament might flow out by the negative pressure, and that would reduce lignin content. There were three stages of combustion: smoldering, open flame, and extinguished. In the smoldering stage, the temperature was low. When the heat release accumulated to a higher temperature, the situation was converted from smoldering to an open flame. The flame was extinguished when entering the calcining stage. The heat release rates (HRR) and total heat release (THR), which are very important evaluation indexes to describe the combustion performance before and after fire retardant treatment, are shown in Fig. 4. The values of the corresponding parameters are listed in Table 3. During the combustion process, the peak values of HRR of the untreated and treated specimens reached approximately 1600 kW/m2and 900 kW/m2, respectively (Fig. 4a). The peak value of heat release rate (PKHRR) of the treated group was reduced by 45.2%. The HRR of the two groups showed a substantial increase from 20 s to 60 s, with a slow descent after 60 s. The PKHRR values of the treated specimens were lower than those of the untreated specimens, which indicated that the GUP flame-retardant could effectively reduce the heat release rate of decorative bamboo filament. The THR for the decorative bamboo filaments with the GUP flame retardant treatment and the contrast are shown in Fig. 4b. The THR value of the GUP-treated group was significantly lower than the untreated group, which was reduced by 42.2% in 115 s. The slope of the THR curve increased starting from 20 s and then decreased. The maximum slope of the untreated and treated group appeared at 40 s and 45 s, respectively, which corresponded to the peakHHR. After 100 s, the THR value nearly stayed the same in each group. 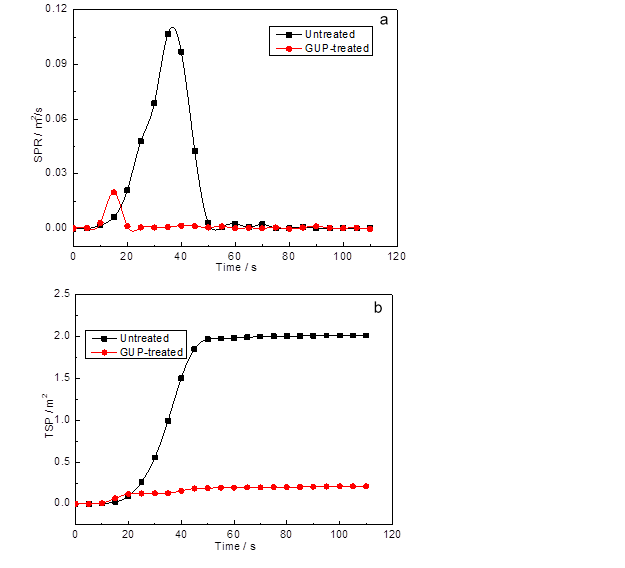 According to Table 3, compared with the treated decorative bamboo filament, the time for the HRR peak of the untreated specimen was a little earlier and the results were from 40 s to 45 s; the ignition time of GUP-treated sample was delayed, and the flameout time was advanced. These results illustrated that the GUP flame-retardant could reduce the propagation speed of flame in the early stages of fire. The sample began to burn with the accumulation of heat. The GUP flame-retardant promoted the catalyst of decorative bamboo filament to the carbon, which was why the combustion process could be ended prematurely. Taken together, these results suggested that the GUP flame-retardant used in the decorative bamboo filament had effective performance in restraining the amount of heat released. When the decorative bamboo filament was ignited, the ambient temperature rose rapidly. Untreated material had a higher rate of decline as the result of the pyrolysis and combustion (Liu et al 2016). However, the treated sample showed a different process because the pyrolysis process was altered by the GUP treatment. According to the pyrolysis performance of the GUP flame retardant, it was converted into polyguanidine (GPP) and simultaneously decomposed into CO2 and NH3, when the temperature was above 185 C. With the temperature increasing, the GPP was finally converted into polyphosphoric acid (PPA), which had the ability to catalyze carbon effectively in the treated decorative bamboo filament for the action of the protic acid. And for precisely this reason, the combustion process ended early (Wang et al 2004; Wu and Toshiron 2005). Poisoning from the smoke released during fire is another important factor for death, so the smoke release rate (SPR) and total smoke release per unit (TSP) were seen as critical parameters in fire retardant performance evaluation. The SPR and TSP curves of the specimens and the correlation parameters during the combustion process are shown in Fig. 5 and Table 4. As can be seen in Fig. 5a, the peak value of SPR for the treated bamboo filaments was much smaller and the appearance time was earlier than with untreated bamboo filaments. In Fig. 5b, the TSP were significantly decreased for treated bamboo filaments. Furthermore, the same variation was found in both the THR (Fig. 4b) and TSP (Fig. 5b) curves, which indicated that the heat release and smoke release occurred synchronously in the flame combustion phase. The TSP of the untreated material increased rapidly in the initial process and stayed approximately the same after 50 s, which was attributed to the release of steam and the incomplete combustion of organic matter in the bamboo filament (Wang 2000; Jia et al. 2013). According to Table 4, the values of peak SPR, TSP, and the specific extinction area (SEA) could be reduced by 67.4%, 95%, and 94.4%, respectively. Therefore, the average CO and CO2 production was decreased after the treatments by 24.1% and 38.9%, respectively. The reasons for excellent smoke suppression of the GUP should be summarized in terms of two aspects: one was the small molecules with low boiling points such as H2O, CO2, and NH3. These compounds could form an intumescent carbon layer in the bamboo filament surface to prevent smoke from escaping; the other was that the catalytic carbonation of the protonic acid shortened the flaming combustion, the shorter the burning time, the less the smoke released (Du et al. 2017). Mold is mainly spread by spores in the air. Once attached to bamboo, the route of infection is transformed into contact. The vascular bundles, vessels, tracheids, and the pits in parenchyma cells are the areas where mold could easily breed in bamboo (Zhao et al. 2014). Resistance against Trichoderma viride (Tv), Penicillium citrinum (Pc), Aspergillus niger (As), and Botryodiplodia theobromea (Bt) are shown in Fig. 6 and Table 5. The untreated and treated samples were placed into petri dishes with the above-mentioned molds. According to observation, the untreated decorative bamboo filaments were rapidly covered with mycelia by the 12th day during the test period, as shown in Fig. 6a, which revealed that the untreated samples had no resistance against the three molds or the one stain fungus. In the process, the speed of mildew growth and mold rate rose rapidly during the first week and increased slowly during the second; the mycelia of Tv, Pc, As, and Bt climbed onto the untreated sample at the fourth, sixth, third, and fourth day, respectively. In order to research the anti-mold performance of the GUP flame-retardant, the growth of mycelium was observed carefully during the testing. The mold resistance capability of the treated bamboo filaments was raised to a certain level, and the mycelia of Pc, As, Bt climbed onto the GUP-treated group on the ninth, seventh and eighth day, respectively. Photos were taken (Fig. 6b) on the 28th day. Compared to the untreated samples, the mold resistance capability of the treated samples raised to different extents, especially, the Pc and Tv seemed to be more influenced by the environment in this laboratory test. The GUP-treated sample had excellent resistance against Tv and betterresistance against Pc, which respectively, increased by 100% and 50%, as calculated in Table 5. The reason for the improved mold resistance of the treated sample against Pc and Tv could be attributed to the ecological properties of the GUP flame retardant. The decorative bamboo filament was always used under dry indoor conditions, and the GUP flame retardant was always used as the solid form deposit in the bamboo cells. When the environment humidity reached 85% (the test condition), the water vapor molecules combined with the GUP powder and brought some flame retardant out of the sample. Due to the extreme hypotoxicity of the GUP, the growth environment was destroyed, and mold growth was inhibited. After the GUP treatment, the agglomerates were clearly visible at the weakest point of penetration of the parenchyma and vessel part. During the color test, the L* decreased slightly from 76.6 to 71.7, a* and b* showed no change before and after the treatment. The color after the treatment had changed very little. During the combustion process, the flame combustion time decreased from 63 s to 50 s; the HRR peak value and THR of the GUP-treated samples were reduced significantly and respectively by 45.2% and 42.2% in comparison with the untreated decorative bamboo filaments. The peak value of SPR, TSP, and SEA were reduced substantially with the GUP treatment during the combustion process. The average of CO and CO2 production was decreased in varying degrees. The CO was reduced by 24.1% and the CO2 was 38.9%. The results of mold resistance testing indicated that the mold resistance capability of the treated samples raised to different extents, especially, the Pc and Tv were more influenced by the GUP for the extreme hypotoxicity. The authors acknowledge the financial support from the National Natural Science Fund project “Characteristic of pits in bamboo” (31770599) and the Special Scientific Research Fund of Construction of High-level teachers Project of Beijing Institute of Fashion Technology “research of surface characteristics of low temperature plasma modified decorative bamboo filament” (BIFTQG201805). The authors are also thankful to Luo Wensheng of Beijing Shenda Huayuan Technology Co. LTD. for technical guidance in this study. Guan, M. J., Zhou, M. M., and Yong, C. (2013). “Antimold effect of ultrasonic treatment on Chinese moso bamboo,” Forest Product Journal 63(7/8), 288-291. GB/T 18261 (2013). “Test method for anti-mildew agents in controlling wood mould and stain fungi,” Standardization Administration of China, Beijing, China. GB/T 8624 (2012). “Classification for burning behavior of building materials and products,” Standardization Administration of China, Beijing, China. ISO 5660.1 (2002). “Reaction to fire tests-Heat release, smoke production and mass loss rate-Part 1: Heat release rate (cone calorimeter method),” International Organization for Standardization, Geneva, Switzerland. Jin, X. B. (2015). Preparation and Performance of Bamboo Laminated Lumber Treated with Flame Retardant, Masters Dissertation, China Academy of Forestry, Beijing, China. Jin, X. B., Li, Y. Y., and Wen, X. W. (2015). “The thermal degradation and combustion properties of bamboo treated with P-N-B flame retardants,” China Forestry Products Industry 42(12), 40-44. Kurt, R., Mengeloglu, F., and Meric, H. (2012). “The effects of boron compounds synergists with ammonium polyphosphate on mechanical properties and burning rates of wood-HDPE polymer composites,”European Journal of Wood and Wood Products 70(1/3), 177-182. DOI: 10.1007/s00107-011-0534-2Li, H. (2017). “Comprehensive assessment and performance of modified decorative bamboo filament,” PhD Dissertation, China Academy of Forestry, Beijing, China. Li, H., Yu, L. L., and Lu, F. (2016). “Manufacturing process and application prospect of decorative bamboo filament,” World Bamboo and Rattan 14(3), 31-35. Liese, W. (1998). The Anatomy of Bamboo Culms, Brill, Leiden, The Netherlands. Liu, S. J. (2013) Preparation and Performance of Fire Retardant Bamboo-based Fiber Composites, PhD Dissertation, China Academy of Forestry, Beijing, China. Liu, Z. J., Hu, W. H., Jiang, Z. H., Mi, B. B., and Fei, B. H. (2016). “Investigating combustion behaviors of bamboo, torrefied bamboo, coal and their respective blends by thermogravimetric analysis,” Renewable Energy 87, 346-352. Ma, X. X., Jiang, M. L., and Qin, D. C. (2012). “Macro- and micro-structural changes in bamboo after attack by various fungi,” Scientia Silvae Sinicae 48(11), 76-82. Walter, L. (2005). “Preservation of a bamboo culm in relation its structure,” World Bamboo and Rattan 2005(03). Wang, Q. W. (2000). FRW Fire Retardant for Wood, PhD Dissertation, Northeast Forestry University, Harbin, China. Wu, Y. Z., and Toshiron, H. (2005). “The burning behaviour of plantation wood treated with ammonium phosphate,” Scientia Silvae Sinicae 41(2), 112-116. Yu, H. X. (2015). Analysis on Mechanism of Bamboo UV Photo Aging, PhD Dissertation, China Academy of Forestry, Beijing, China. Yu, L. L., Liu, X. M., Qiu, F. Q., Ren, H. Q., and Fei, B. H. (2015). “Exploitation and application of bamboo filament decorative materials,” China Forest Products Industry 42(7), 5-9. Yu, L. L., Lu, F., Qin, D. C., Ren, H. Q., and Fei, B. H. (2017). “Combustibility of boron-containing fire retardant treated bamboo filament,” Wood and Fiber Science 49(2), 125-133. Zhao, Z., Li, L., Meng, Y., Su, J. M., and Zeng, Y. B. (2014). “The decaying process of bamboo under different mould conditions,” Journal of Bamboo Research 33(1), 46-49. Article submitted: December 6, 2017; Peer review completed: February 20, 2018; Revised version received and accepted: March 9, 2018; Published: March 21, 2018.